When ping TIMEOUT (3 consecutive packets) will trigger program, send mail or send SMS. When ping NORMAL (3 consecutive packets) from TIMEOUT will trigger program, send SMS or send mail. this software download will send e-mail or send an SMS alert when there is a Ping timeout. 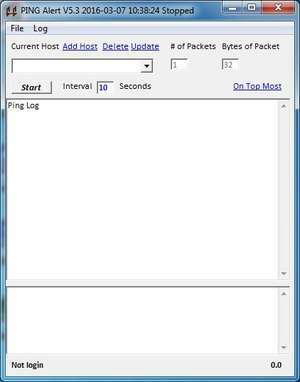 Ping Alert provides you the ability to set numbers of packs, bytes of packets, and time intervals. For security reasons, you should also check out the Ping Alert download at LO4D.com which includes virus and malware tests. Additional screenshots of this application download may be available, too.